ABBEYFEALE ON LINE! : OFF TO DUBLIN IN THE GREEN! OFF TO DUBLIN IN THE GREEN! 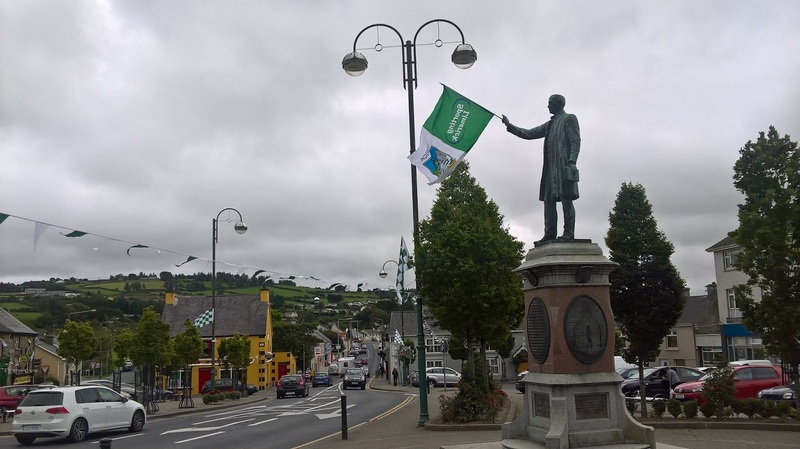 Limerick flags flying high over Abbeyfeale this week in support of our hurlers, and even Father Casey seems to be getting in on the act! Abbeyfeale Hill was never known as a hot-bed of hurling. The mountainy meadows and wet fields of rushes, made it difficult for us to wield the camán with any degree of accuracy or skill. The lowlands of the Golden Vale was where the best hurling was played, while up on The Hill, we were better known for our prowess on the football field. Knocknagoshel and Duagh were mere villages compared to Abbeyfeale yet they had managed to produce such great footballing legends as Eddie Walsh and Dan McAuliffe. Kerry folk visited Abbeyfeale in large numbers back then, attracted by the bright lights, the lure of cheap porter and the weekly dance at Tom Tobin’s Hall. The local girls were smitten by all these good looking fellows claiming to play for Kerry and many were swept off their feet and born away in triumph to the heartland of The Kingdom where they settled down and reared large families that became the next generation of footballing greats. It was like creating a human conveyor belt of green-and-gold figurines, all togged out and ready for action. If Jack Charlton had ever become our manager, half of that Kerry team of the seventies would have been playing for Limerick under the grandparent rule and we might very well have been the team going for five-in-a-row! My first hurley was bought in Pattie Roche’s and cost the princely sum of 2/6! There was a flat ribbon of green space along by the edge of the mountain at the back of our house. A couple of us would mark out makeshift goals with coats and jumpers about twenty yards apart and take pot-shots at each other. The first to score six goals was the winner. In summer, we pucked a few balls in the meadows after the hay had been saved and before the cattle were left in to graze the after-grass. There was no second cut in those days. When winter arrived, we moved our goalposts and played on the road. Road hurling was difficult. The roads were not tarred and we spent most of our time searching in dykes and ditches for lost balls. We normally used a rubber ball until someone gave us the present of an ancient sliotar. The stitching was torn and the stuffing burst through. As soon as it got wet it was like hitting a soaked sponge. We quickly abandoned it and reverted back to our trusty rubber ball. We followed the fortunes of Limerick hurling and read of their “exploits” in the local Limerick Leader. But, in truth, there was little to get excited about. The hurlers were almost as bad as the footballers. They won a Munster title in 1955 after a gap of 15 years, trained by famed Mick Mackey. It would another 18 years before they won it again in 1973. They then went on to win their first All Ireland title since 1940. If the sums are right, (and I’m not great at maths) that makes just one All Ireland senior hurling title in the 77 years between 1940 and 2017! That can’t be right – can it? And so to next Sunday. We travel in expectation once again. It has been a long journey. The bookies make us outsiders. That suits us fine. We quietly think we can win. The flags are waving. The bonfires set. A generation holds its breath. Is the famine finally about to end? We dare to hope.